Olixir Technologies offers Rugged, Transportable, High Capacity, High Performance, External Drives, 19" Racks and Towers for Government, Military & Business. This high capacity semi-rugged external hard drive protects your data from knocks, jars, and drops using patented shock protection technology. Olixir’s best value on a “cost per GB” basis. Use with USB 2.0 cable, in a tower or a 19″ rack. A drop onto a hard surface from as little as ¼-inch (6 mm) can cause defects on the surface of the drive, so extreme care must be exercised when handling disk product. Because of such fragility, most external drives should never be moved. Even if your drive simply sits on your desktop, you must take extra precaution to prevent an accidental drop or even a small knock. If this vulnerability is a concern to you, there are portable hard drives that use a more durable laptop bare drive internally; however, these are expensive, limited in capacity, and often are designed with sufficient durability. Provides 1,200G of patented shock protection in a high-impact case, which keeps your data protected from knocks, bumps, or accidental drops. Uses high-quality internal drives. This drive is over 425% more shock protected than over 35 other models! Choose from 1TB to 2TB — larger than most other portable drives, DLT tapes, and equivalent of hundreds of CDs and thousands of floppy disks. With 7200 RPM, and up to 40 MB/s sustained transfer rates, this drive can move a Gigabyte data in less than 25 seconds. Amazing Reliability Backed by a Two-Year Guarantee! We confidently provide a two-year warranty, including drops! Most portable and external drives have just a one-year warranty. Plug-and-play with Windows 2000+, Macintosh OS, and Linux. At 4.4 x 7.5 x 1.4 inches, this drive is about the size of a VHS tape. It is over 40% smaller than many popular external drives. 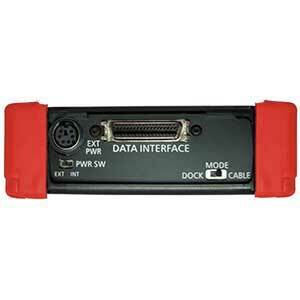 Use INTERCHANGEABLY with USB 2.0 cable, or with 5.25 docking bay! By using a 3.5 bare drive internally, this external hard drive offers more capacity for the price compared to “rugged” portable drives. This external hard drive is widely considered to be one of the best in the world by publications such as Tom’s Hardware Guide. The excitement stems from its ability to meet all eight criteria of the Portable Hard Drive Checklist Standards and its unsurpassed versatility. What Makes A Great External Hard Drive?